McCarter Theatre Center’s annual production of Charles Dickens’s A Christmas Carol has long been a staple of family holiday celebrations in Central New Jersey. Even 18 years after the previous version premiered, the show routinely drew huge crowds during its December run. Still, it was time for a new approach, and the revamped 2016 production is a gem. Director Adam Immerwahr sought a solid Victorian England vibe for this sparkling new production, which premiered December 10 and runs through December 31. Immerwahr’s intent was to explore how Scrooge’s redemption “isn’t just the redemption of one man . . . when a person changes, it can transform an entire community.” Then he drew on “the treasure trove of terrific Christmas music of Dickens’s era” (carol playlist) for songs and even the underscoring of the play, whose music was composed by Obie-award winning Michael Friedman. 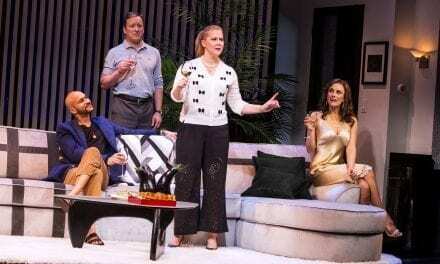 The show manages to be both different, with fresh sets and staging, and familiar, retaining the adaptation by award-winning playwright David Thompson. 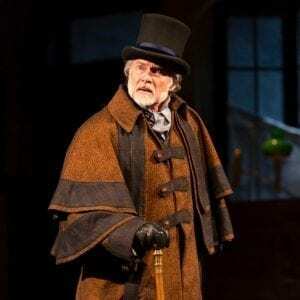 Ebenezer Scrooge (played by Greg Wood) has never said “Bah! Humbug!” with more feeling, Bob Cratchit (Warner Miller) never more patiently put-upon, and the rest of the cast never more lively, including: Fred/Undertaker (JD Taylor), Lily/Belle (Jamila Sabares-Klemm), Mrs. Dilber (Sue Jin Song), Fan/Miss Kate (Kelsey Carroll), Solicitor Matthew/Young Scrooge (A.J. Shively), Solicitor David/Mr. Fezziwig (Lance Roberts), Mrs. Cratchit (Jessica Bedford), and Mrs. Fezziwig/Lady Char/Laundress (Anne L. Nathan). Dickens’s work is stuffed with memorable characters and many parts amount to a cameo, but all were quite up to snuff. The familiar tale of a miser’s comeuppance is all there, as the Ghost of Christmas Past (Ivy Cordle) reminds him how he gave up youthful opportunities for happiness in order to pursue wealth; the Ghost of Christmas Present (Mimi Francis) shows him how others, especially the Cratchit family, live now; and the Ghost of Christmas Future (Elisha Lawson) lays out a frightening scenario that causes him to vow to change. Old Marley’s ghost (Frank X) is particularly effective (frightening a child sitting in front of me) and has my favorite line from the story, the sententious “I wear the chains I forged in life.” The early dark scenes change to light as Scrooge wakes Christmas morning a new man. The cast is augmented by a 27-member community ensemble and dozen-member children’s ensemble, who greet theatre-goers, carol and ring bells from the stage, the aisles, and the boxes, and dance exuberantly! The entire audience becomes involved, together singing a carol at the beginning and end of the performance. Also underscoring the community nature of this production are the theater’s plans for sold-out Fezziwig Parties, a drama workshop for children on the theme of kindness and generosity (called Cratchit Kindness) on December 28, and engagement of local businesses in developing unique refreshments.